This is a picture of a Pivot staffer, David Eby, displaying the new Pivot/MEC Rights Blanket. What's the Rights Blanket? A little over a year ago, the idea was to stencil the contents of a Pivot Rights Card onto a space blanket. Space blankets don't like direct heat. A joint project between Mountain Equipment Co-Op and Pivot, the Rights Blanket is light-weight, rugged, and easy to pack. Made of the same material as MEC’s high-end rain jackets, the Rights Blanket acts like a large, light-weight tarp with foot pockets, drawstrings and a built-in "stuff sack". It wraps around a sleeping person, their clothing and insulating blankets, protecting them from water and wind. 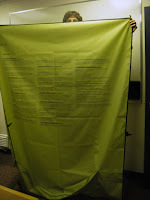 Silk-screened onto the inside of the Blanket, in 26 point font, are various need-to-know rights for homeless people, including their rights in relation to panhandling, security guards, housing, policing, and welfare. Congratulations to both Pivot and MEC for sticking with the idea and creating the blankets. Buy the blankets and share them. The first run of 500 Rights Blankets will soon be gone, but Pivot is already taking orders from the general public for the next batch. Interested people can provide a Rights Blanket to a homeless person for $50.00. Donors have the option of picking up the Blanket themselves to give away to someone in need, or having a non-profit agency in the Downtown Eastside give it away on their behalf. People who wish to donate a Rights Blanket can place an order online or call Pivot at (604) 255-9700. Oh ... the need to know rights are here - in case you haven't had a chance to order your Rights Blanket. David Eby, a lawyer with Pivot, hopes the blanket campaign will raise awareness about the homeless situation in Vancouver, where there are only 700 shelter spaces available for the estimated 2,300 people who live on the streets. Once again, we're pleased to encourage support of US based Civic Ventures and the Purpose Prize. Civic Ventures has opened nominations for the 2008 Purpose Prize, a major initiative that invests $100, 000 in people over 60 who are leading a new age of social innovation -- domestically and abroad. The prize propels the work of social entrepreneurs and publicizes a trend of adults in the second half of life combining their creativity and experience to tackle some of the world's biggest challenges. Be at least 60 years old (by the deadline of March 1, 2008). Be a legal resident of the U.S. (including U.S. territories). Be currently working in a leadership capacity in an organization or institution (public, private, nonprofit, or for-profit) to address a major social problem in the United States or abroad. Have initiated important innovations (in a new or ongoing organization) after the age of 50, and have demonstrated creativity and leadership within the past five years or so with the promise of more to come. Please note that elected officials are NOT eligible for the Prize. Individuals working in faith-based service organizations that have a broader social mission are eligible AND ENCOURAGED TO APPLY, but the purpose of their project cannot be strictly religious or sectarian--in that it is confined EXCLUSIVELY to individuals within a denomination or for THE SOLE purpose of expanding the religious mission of the denomination or faith. Here's the link to the nomination page.